We perform six types of foundation repair: carbon fiber reinforcement, epoxy injection, footing underpins, lally columns, steel I-beams and wall pins. Carbon fiber reinforcement uses high-strength carbon fiber strands woven into a virtually unbreakable fabric that doesn’t stretch. During foundation repair, the carbon fibers are epoxied to the damaged foundation walls at determined intervals. A steel angle is usually added to the top of the wall between floor joists, completely stabilizing the foundation so no further movement occurs. In epoxy injection, a low-pressure injection of epoxy resin is pumped through injection ports installed along the length of the crack and allowed to cure to form a permanent seal. Epoxy injections are performed from inside the basement, so no excavation is required. Depending on the type of repairs needed, we could use footing underpins to stabilize and strengthen your home’s foundation. There are several methods used to underpin a foundation, but the most common one is the mass pour method. Here, sections of the foundation are excavated in sequence to a predetermined depth below the footing and each pit filled with concrete. Lally columns are steel support columns that hold up the floor above a basement. There are many types of lally columns – brick, wood/logs, block, hollow steel, and metal columns filled with concrete. The columns are extremely strong and provide the much-needed support to floors above a basement. Steel I-beams are particularly useful when there is bowing or leaning in your walls – a common sign of foundation settling. The beams can cure this problem. The foundation floor is jackhammered where beams will be installed and bolted to the wooden floor joist above. 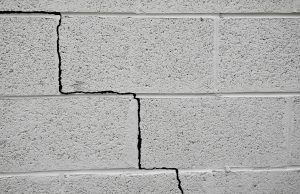 If you live in the Northern New Jersey area and are seeing wall and floor cracks or any other signs that suggest foundation damage in your home, call us immediately. The longer you wait, the worse the problem will get. We will inspect the damage to determine the best foundation repair solution for your problem.